Thousands of people from different walks of life, including school students on Sunday took part in the fourth Dibrugarh Marathon. Marwari Yuva Manch Dibrugarh Greater organized the marathon. The marathon was flagged off at Old Government Boys’ High school field at 5.30 am. This year’s theme of the marathon is Keeping Track on Environment. In the half –marathon (21.1km), Sanjay Bhumij stood first. 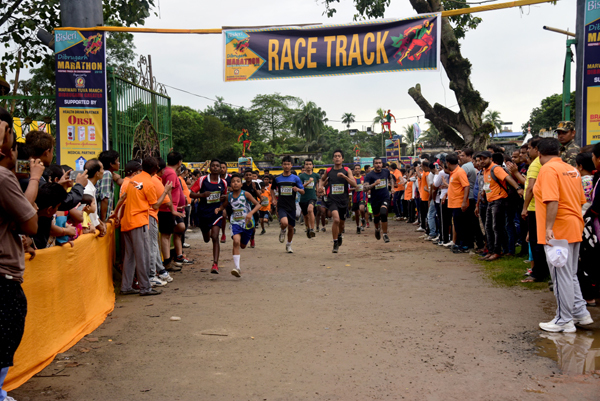 In the 7km run, Debojit Khalkho and Rumi Munda stood first and Analisha Saikia and Sunil Sen stood first in the 5 km run. In the 11 km run, Sonjip Bagh and Maina Munda bagged first prize. The event is divided into four categories – a 5 km run for participants aged 10 years and above, a 7 km run for 14 years and above, 11km for participants aged 14 years and above and a half-marathon (21.1km), which has been introduced this year, for participants aged 16 years and above. Public relation officer of the event Subir Kejriwal said, “This year two thousand people from different walks of life participated in the event. This year we are very much delighted to see the enthusiasm of the people. The theme is ‘Keeping Track on Environment’ because we need to focus on our environment by eliminating the uses of plastic which is degrading the environment,”. He said this year for the first time they have organized the half marathon which saw maximum participants. “Our event was due to take place on August 19, but due to the death of our former prime minister Atal Bihari Vajpayee, the event got postponed and finally today we have successfully hosted the event after one month of heavy preparation,” the PRO of the event added. Kejriwal said, “The event is gaining popularity. Last two year, 1600 odd people had participated but this time it increased and we hope that in coming years more people will participate in the event and Dibrugarh Marathon will become a much popular event in the state as well as the country. Marathon is not a popular sport in this part so; we are leaving no stone unturned to popularize the game in this part of the world. This time Bisleri is the title sponsor of our event,”. Kaushik Kashyap, a Mumbai based singer enthralled the audience with his performance. He performed some of the top Bollywood songs.